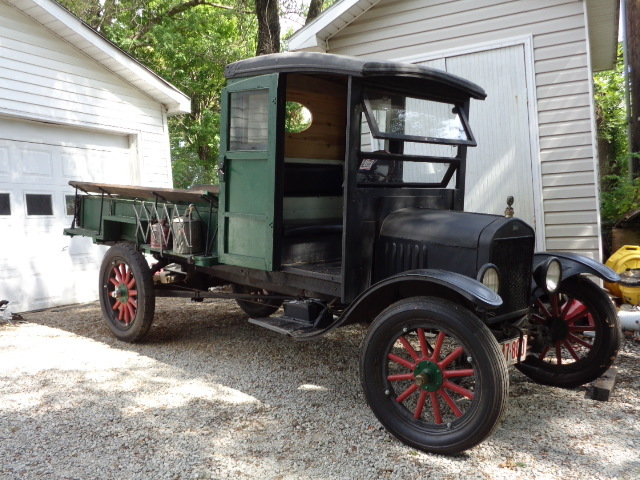 Hello all I have found myself reading post on this forum recent and past postings after searching for information and adjusting of the model t. I have a 21 TT with a later model engine that appears has not been rebuilt since new. Thanks for starting your first thread ! As we like to say around here, welcome to the affliction. If you want to post the engine serial number I can give you the assembly date. Boy are you in for some fun. Welcome! Welcome to the forum and the hobby! You are in an excellent area that has several local chapters nearby. I would encourage you to visit them and decide which one is a good fit for you. They often meet at what was the Piquette Ford Plant that was used by Ford USA to assemble the Models Ford Models B, C, F, K, N, R, S, and early Model Ts. They are a chapter of both the MTFCA & MTFCI (both of the national T clubs). I'm sure you can find one not too far from you. And they can be a world of help and inspiration. It looks like your Ton Truck has been used and not just stored. If the previous owner used it a lot that is a good sign. If it is parked for a long time that can sometimes be a good sign. I.e. did they park it because the owner didn't want to be bothered by car salesmen so he bought a car to get rid of them. (That actually happened in the case of a 1917 Model T Touring -- often call the "Rip Van Winkle Ford." See: http://www.mtfca.com/discus/messages/506218/550619.html?1434989640 ) Or did they park it because they took the front end apart and put it back together incorrectly? And on the first test drive it almost killed them because the front wheels would go full left or right without the driver's input? (Having seen that once as a kid -- I'll never forget the experience.) Anyway -- your truck appears to be driving so that is good. But please check out the safety items at: http://www.mtfca.com/discus/messages/506218/576808.html see the second posting down from the top. Note your Ton Truck will NOT have the issue with the babbit thrust washers in the rear axle. The car has that problem but to my knowledge the Ton Truck rear axle does not have the problem. But the issues with how to avoid breaking your arm or burning the house down are still very appropriate. The Model T is a faithful servant but it has some known issues that the driver needs to be aware of and to take proper precautions about or it can bite you. Steve Jelf often includes the link to his excellent list of books he recommends for new owners on his web site at: http://dauntlessgeezer.com/ with the T section at: http://dauntlessgeezer.com/DG52.html and the recommended books listed at: http://dauntlessgeezer.com/DG80.html Worth checking out. Note some of the clubs have a library that will loan books to members. And to help you with parts identification etc. I like Lang�s Old Car Parts on line catalog (you can also down load it as a PDF) available from: https://www.modeltford.com/download.aspx 16 mb so on a slow connection start the down load when you are going to do something else. Many of the photos are in color. Many but not all of the part numbers are the same as those used by Ford. They also have some helpful tips in the catalog. They are also great folks to deal with. As are most of the other vendors. Again, welcome to the hobby and forum. Welcome Ralph, you are in the right spot for T info. You wont find more knowledge and willingness to help than this group. Post some photos of that T! We want to see. With apologies to Ralph If I stepped out of line posting his profile pic. Thanks for the response now I Know I have access to the forum I have tried before now a Question how much crankshaft end play is considered safe. All I know about mag clearance is that a completely shot engine will still provide AC lighting voltage! What I know about mag clearance and what I have read mine shouldn't work but it works fine.